What Does Detection Tower Do? This card does two things. One of them is simply to tap for a colorless mana. It takes up a land slot (more on this later) rather than a spell slot. As long as you can afford a slightly greedier mana base, adding Detection Tower is kind of free. But more than that, Detection Tower can steal Hexproof from “opponents and creatures your opponents control”. 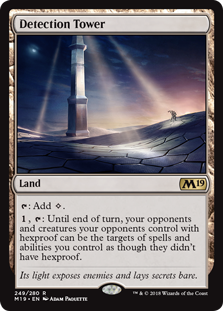 The Standard format has simply gone so far in a particular direction (or set of directions) that ridding yourself the horrors of Hexproof becomes very attractive. Carnage Tyrant – Most opposing Golgari decks will play 2-3 Carnage Tyrants. This giant dinosaur will kill you if left unanswered. It lives through Find // Finality, which clears the path. BUT! If you cause Carnage Tyrant to lose Hexproof, it becomes a six casting cost creature that did not generate card advantage. Niv-Mizzet, Parun – The Adrian Sullivan builds incorporating Dive Down changes the Izzet-Golgari matchup. While Golgari still has Vivien Reid, The Eldest Reborn, and Ravenous Chupacabra for cards that can kill Niv-Mizzet without triggering it. Golgari retains those tools… But Dive Down changes, dramatically, what having those cards means. Can Jeskai Play Detection Tower? Golgari has natural synergy with Detection Tower. With Merfolk Branchwalker, Jadelight Ranger, and potentially Seekers Squire as its Explore card advantage guys, Golgari’s draw engine is especially suited to finding a specialty land (or two). The opposite is, unfortunately, true for Jeskai. Rather that having a natural synergy with its key creatures… Because both Cracking Drake and Niv-Mizzet, Parun require all blue and red mana, Detection Tower can’t help cast any of them. Michael and Patrick spitball how to incorporate this land despite the challenging Jeskai mana base. Find out how in this week’s podcast!